Some of you may think that this post is late in coming but I just picked my last bell peppers and tomatoes two weeks ago. I did have to move them into the garage with a grow light in order for them to ripen since it had started getting cold here, but the patience paid off because they are delicious. Peppers are one of my favourite vegetables. For you new readers who haven’t been updated before, here is a little background. Last year, after moving into our house, my husband and I planted our first container vegetable garden. We grew everything in containers and I must admit it worked out great. I could move the plants into shade if the weather was too hot and they would drain better if we got heavy rains. I am definitely hooked on this garden method. This year we tried our luck again and we got even better results. With such a dry hot summer, our plants were producing like crazy. As always, I would check how my veggies were doing every day: if they got bigger, if they started to send out fruit. It honestly was the highlight of my day. That satisfaction has continued into the kitchen when I can say that dinner is from the backyard. Boy does food taste better when you know where it comes from and you make it yourself. Our freezer is stocked so we can slowly enjoy our bounty through the winter. We also grew numerous herbs such as basil, rosemary, oregano, green onions, etc. but I didn’t record those numbers. Next year we may add some new plants to the mix and we will hope for the same return. I have some different kinds of tomatoes I want to try. Between our garden and our CSA we are stocked…not to mention all the berries we have from going picking. If you came to our house for dinner you would be guaranteed to taste some fresh, organic, produce in your meal. So, how were your gardens? If you don’t have one, have I convinced you to start one next year? That is awesome Miss T! The picture is gorgeous! We just got started with basic herbs, but then the season’s already over. Maybe we’ll have better luck next season! Glad to hear you have started. Herbs are one of the best things to start with because they are easy to grow. Plus they can grow indoors well. Once you get the hang of these, spread your horizons. You can definitely try a few new things in the spring. Let me know when you start and I can share some tips. I love it. The stuff is so good. In fact, friends and family often try to invite themselves over just so they can have some too. These were little Japanese style eggplant. We love them actually. Not only are the pretty and easy to grow but they are also very versatile. I put them in lasagnas, stirfrys, pasta dishes. I will even put them in grilled sandwiches. I don’t have a garden, and I wish I could grow one! Living in a condo is tough enough, but when you don’t get enough light through to the balcony it’s nearly impossible. Seeing that I cook almost every night of the week, it would be great to be able to walk a few feet and grab some fresh herbs rather than use those dried out canisters from the supermarket (the fresh ones don’t seem to last very long either). Try using a grow light. You can set up some pretty cheap systems that work really well. They are great for small spaces. If you want advice on brands etc. let me know. I would be glad to help. We have a very limited garden. Mostly flowers and some herbs. Hey, a garden is a garden. Good for you for growing some herbs. In fact when it comes to return on investment with gardening, herbs are the best thing to grow. They are the most expensive thing to buy in the store. That is awesome Miss T! As you know – my wife and I started our first garden this summer, but it was nowhere near these results. 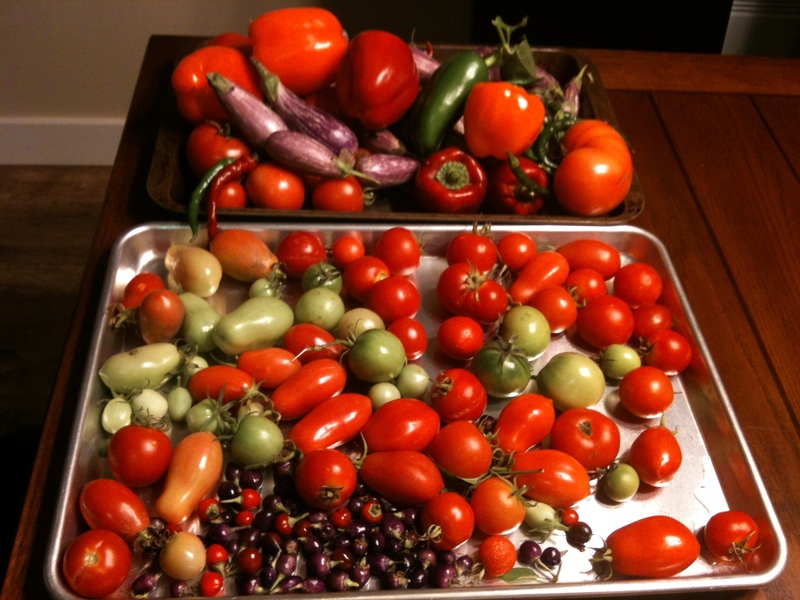 Granted, we did it in our landlord’s backyard in pots… but maybe this is the inspiration to expand our garden next year. Hey you started which is great. My entire garden was also grown in containers so if you are short on space, don’t think you can’t be successful. In fact, I find container gardens perform better than ground gardens. I hope to replicate half of your success in my garden next year! Thanks. You should start one for sure. Use containers. This is what I do and it works awesome. You have to water a bit more but your plants are much more protected allowing a better yield. When you go to get organized next year, give me a shout and I can help get you started. Wow, that’s a great yield! nom! Thanks. We were happy with it. Just yesterday I was cooking with squash out my garden. It is such a great feeling. Thanks Maggie. I seem to be quite successful with my container garden. It makes the maintenance worth it. Plus it is just so yummy. What a harvest! No garden here, but am amazed what talented gardeners can do. With such a huge haul, do you also sell some at your local market? Do you plan to do anything different to your garden next year? No I don’t sell anything. We just live off of it all year long through winter. As far as doing anything different, we might try a few different plants to see how they do and taste but otherwise the basics will stay the same. That’s amazing!! How many containers did you have? over 200+ tomatoes- that’s amazing. I was only able to get 2 egg plants and then was only able to eat one because the other one was eaten away by some raccoon lol. I probably have 20-30 containers. I am not sure of the exact number. We are happy with how well we have done the last two years. I am beginning to swear by container gardening. Do you have a fence? If not you should put one up. It will keep the raccoon out. Or, put wire mesh around the plant. That usually works too. Fantastic harvest, Miss T! Blue hubbard squash is one I’ve thought about planting. What recipes did you use it in? Nothing like home-grown produce in the kitchen. I dearly miss our basil and peppers. We’re making do with red and green kale, and swiss chard. I suppose we could have more if I got busy with the hoop house. I find you can use blue hubbard squash just like any other winter squash. In many recipes I find they are interchangeable. All I can say is that they are huge. We actually have to buy a cleaver to process them. They are literally the size of a small child. Crazy! I love Kale. It is really good as kale chips. You should try making them if you haven’t. It sounds like you still did a good job this summer in your garden. Don’t beat yourself up. Sometimes the weather you get dictates how successful you are. Just do the best you can. I have had a garden for years and love to grow veggies. Every year I add something new to grow and I stock up on recipes for the new ingredient; it doesn’t have to be anything big, last year I added variegated chard (kids love the colour) and used it in salads and stir fries. Best bet is that it will come up again this year! That is a great idea. I am going to do that. Add a new veggie each year and try new recipes. Thanks for telling me about this.